LIMESTONE – The Maine School of Science and Mathematics in Limestone and the University of Maine at Presque Isle signed a unique collaborative learning agreement on Wednesday, May 16, that will allow MSSM students to earn college credit while still in high school, giving them a significant and cost-saving head start on college. 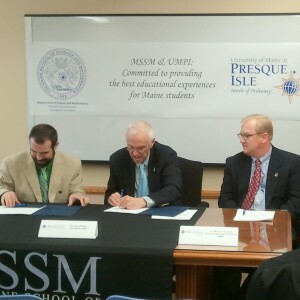 Luke Shorty, Executive Director of MSSM, and UMPI President Don Zillman held a short press conference at the magnet school in Limestone and signed the agreement, which will give MSSM students the opportunity to receive UMPI credit for select MSSM courses they take that are taught by UMPI adjunct-qualified instructors. Shorty and Zillman were joined by UMPI Provost and Vice President for Academic Affairs Michael Sonntag and MSSM Director of Advancement Kate Reilly for the announcement and signing ceremony. As part of this agreement, a process is being put in place to award UMPI credit for specific MSSM courses, based on syllabi and texts approved by UMPI faculty members, to MSSM students who meet admissions standards set by UMPI. This process will involve reviewing selected MSSM courses to determine if they are equivalent in content and rigor to UMPI courses, determining whether MSSM faculty members are qualified to be UMPI adjunct instructors so they can deliver approved courses, and then approving specific courses so that MSSM students enrolled in them can receive UMPI credit for the classes. 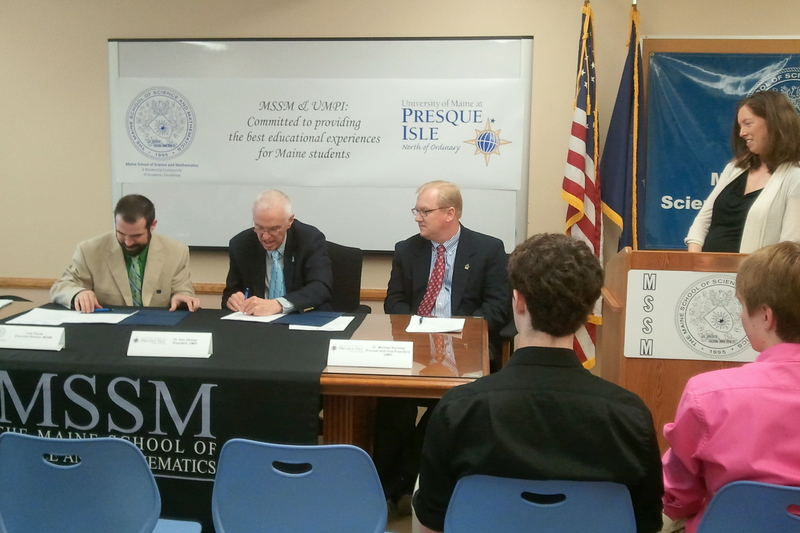 Provost Sonntag explained that UMPI and MSSM’s faculty and administration have worked for months to put together this agreement. MSSM officials are equally excited about the collaboration. The Maine School of Science and Mathematics is a public residential magnet school chartered and funded by the Maine State Legislature. Opened in 1995, the MSSM has over 100 students from 81 towns and cities across Maine and beyond. The school challenges students to achieve their aspirations by fostering intellectual growth through a rigorous curriculum in advanced mathematics, science, and humanities. The residential experience encourages personal accountability and the development of skills in relationships, healthful living and social diversity. This mission is advanced through outreach programs including summer programs for middle-school students and professional development opportunities for teachers throughout the state. In 2012, U.S. News and World Report ranked the Maine School of Science and Mathematics the 38th best high school and 9th best magnet school in the nation, placing it in the top 100 public high schools. The University of Maine at Presque Isle is a state university located in the heart of northern Maine. Established in 1903 as a state teacher’s school, UMPI now offers a wide range of liberal arts and professional programs and a balanced curriculum that promotes a strong foundation in the arts and sciences. As one of seven autonomous campuses within the University of Maine System, UMPI serves about 1,500 traditional and non-traditional students. The University is committed to close student, faculty and staff interaction in support of intellectual growth and personal development, and public service that promotes the well-being of the people of Maine.